David Henry Solomon was born in Adelaide, South Australia on 19 November 1929. He received an Associate Diploma of Chemistry from the Sydney Technical College in 1950. He completed his BSc (Hons) from the NSW University of Technology (now the University of New South Wales) in 1952 for his thesis titled: ‘The Oxidation of Some Active Methylene Systems’ and his MSc at the same university in 1955 with a thesis entitled: ‘The Oxidation of Some Active Methyl and Methylene Systems’. He completed his PhD at the University of New South Wales in 1959 with a thesis entitled: ‘Studies on the Chemistry of Carbonyl Compounds’. 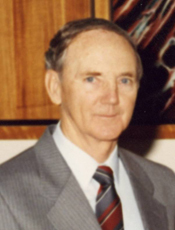 He was awarded a DSc from the University of New South Wales in 1968 for his thesis: ‘Studies on the Chemistry of Coating Compounds’ and an Honorary DAppSc from the University of Melbourne in 2005. He began his career at what is now Dulux Australia. There he developed a strong interest in polymers, the binder that holds paint together. During the course of his degrees (1946-59), he was employed as a Trainee Chemist by Balm Paints (later the name changed to Dulux Australia). He worked in all aspects of the paint industry from quality control and checking factory production through to factory planning and the development of new paint systems. For the period 1955-63, he was the leader of the Resin and Polymer Research Section of Dulux. In 1959-60, he was seconded to ICI Paints Division, Slough, UK to further develop patentable ideas which he had originated in Dulux, Australia. This period also broadened his experience and exposure to the coatings industry, and he attended conferences in Canada and the UK as a representative of Dulux Paints. His book The Chemistry of Organic Film Formers was published in 1967 by John Wiley in New York, (reprinted in 1977) and is still used and available as a reference work. His interest in research was so strong that he joined, in 1963, the CSIRO Division of Applied Mineralogy as a Senior Research Scientist, to further his studies in Polymer Chemistry. In the period up to 1970, he was promoted to Senior Principal Research Scientist. At this time he became interested in the interaction between mineral fillers and organic polymers. As a result of a lecture given to the American Clay Mineral Society in 1968, an arrangement was reached between the Georgia Kaolin Company in Elizabeth, New Jersey and CSIRO, for him to be seconded to work at Georgia Kaolin during 1968-69. The inventions that arose from this period with the Georgia Kaolin Company were available free of charge to CSIRO for use in Australia. This period saw his interest in mineral/organic interactions develop considerably and resulted in 18 publications as well as two reference books ‘ The Chemistry of Pigments and Fillers, published by John Wiley, New York (1983) and The Catalytic Properties of Pigments, Technical Association of the Pulp and Paper Industry Inc., Atlanta, Georgia (1977). In 1970, he transferred to the CSIRO Division of Applied Chemistry and was promoted to the grade of Chief Research Scientist. In this capacity he established the Polymer Research Group within the Division. This Highlight provides the story of one of the most remarkable conceptual advances from the field of polymer chemistry from the past 20 years. The author of this work has influenced the field of radical polymerisation more than any other and it is beautiful to see how his discoveries came about. Very few from the field knew the truth about the discovery of Living Radical Polymerisation and therefore this Highlight will be a must on every polymer scientist’s desk. This polymer research resulted in the publication of the book Step Growth Polymerizations and the reference books on Free Radical Polymerization. His industrial achievements are best exemplified by the Australian Bicentennial $10 Banknote, where he was a principal inventor as well as the project leader from the inception through to the technology transfer stage of the project. He also invented and transferred to production novel hydrogels (Manufactured by NuSep in Sydney). In 1980-81, he spent a considerable amount of time on secondment to the Reserve Bank to assist in the transfer of the technology related to Australia’s plastic banknotes. In 1986-87, he served as Acting Director of the CSIRO Institute of Industrial Technologies with responsibilities for several CSIRO Divisions. In 1990, he accepted an invitation to become the ICI Australia ‘ Masson Professor and Head of School of Chemistry at the University of Melbourne, a position he held until he ‘retired’ in 1995. Since that time he continued as a Professorial Fellow in the Department of Chemical and Biomolecular Engineering at the same university with interests in the use of polymers in minimising water evaporation and in suppressing talc in nickel ore flotation processes. Solomon DH, 2009, Personal communication.